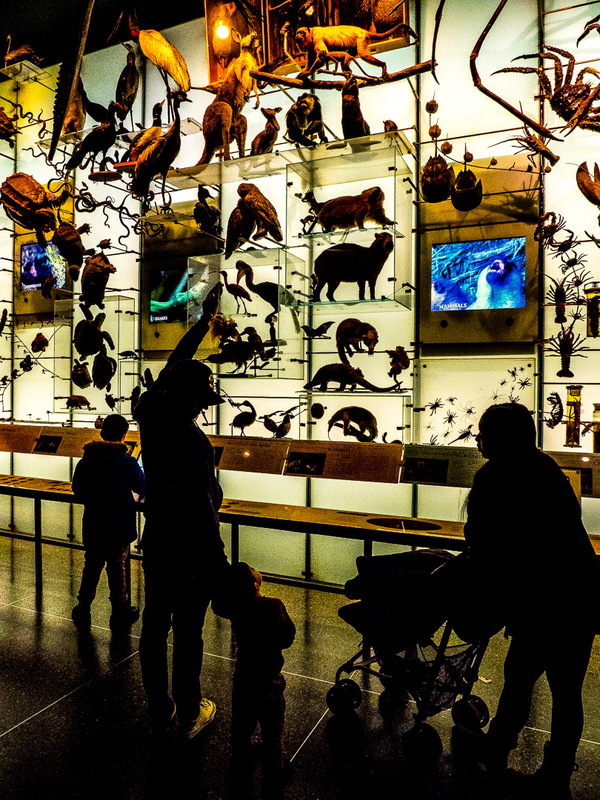 As the AMNH is included in the New York City Pass, we could fast lane directly into the exhibitions behind the Theodore Roosevelt Entry Hall. 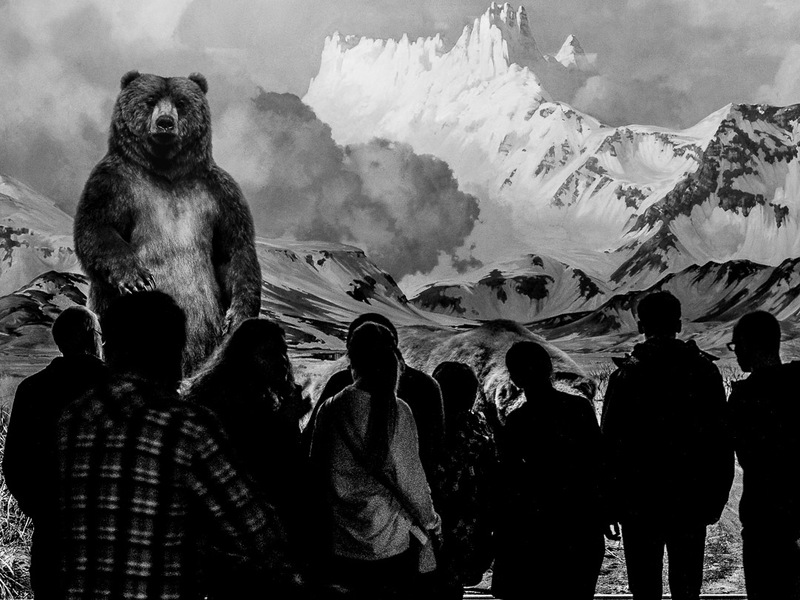 Particularly nice are the mammal exhibitions, featuring stuffed specimen placed in beautiful dioramas of their natural habitats. There are animals from around the world, specifically nice are this displays of North American mammals and African mammals. Next we ventured into the space exhibit, were the AMNH features one of the world’s most modern planetariums, where we saw a great show about the creation of the universe and the Big Bang Theory. The walls outside the theater featured large prints of the moon photographs taken by the Apollo astronauts. 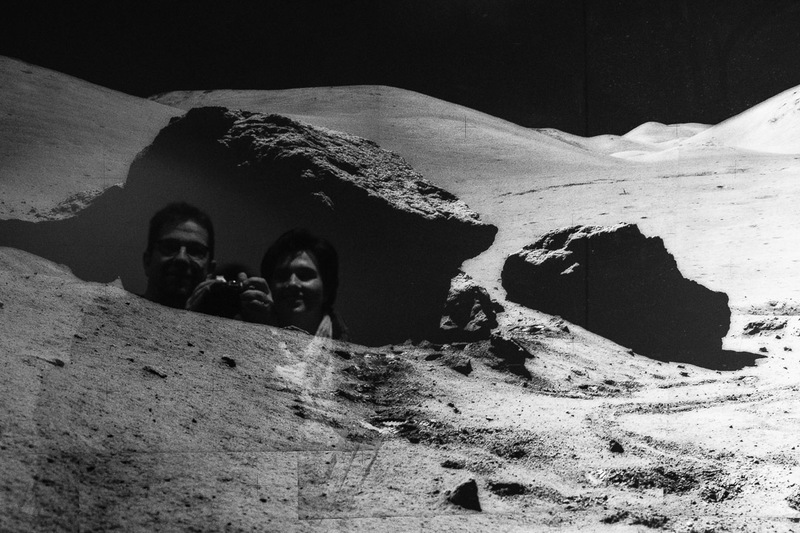 A good opportunity to place The Significant Other and myself on the surface of the moon ;-). There are many meteorites and also a moon rock on display and you can touch those pieces from outer space. 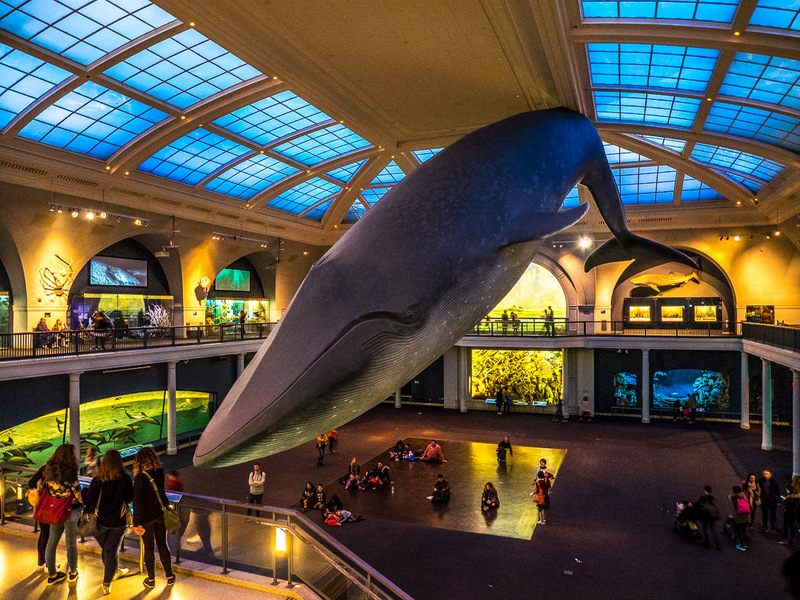 Very impressive are exhibits about biodiversity and the Hall of Ocean Life, where a life-size replica of a Blue Whale, the world’s largest living animal, is hanging from the ceiling. Next we visited the Hall of Human Origins, where we came face to face with our own natural history, as this skeleton of a prehistoric Neanderthaler (from Germany) demonstrates. 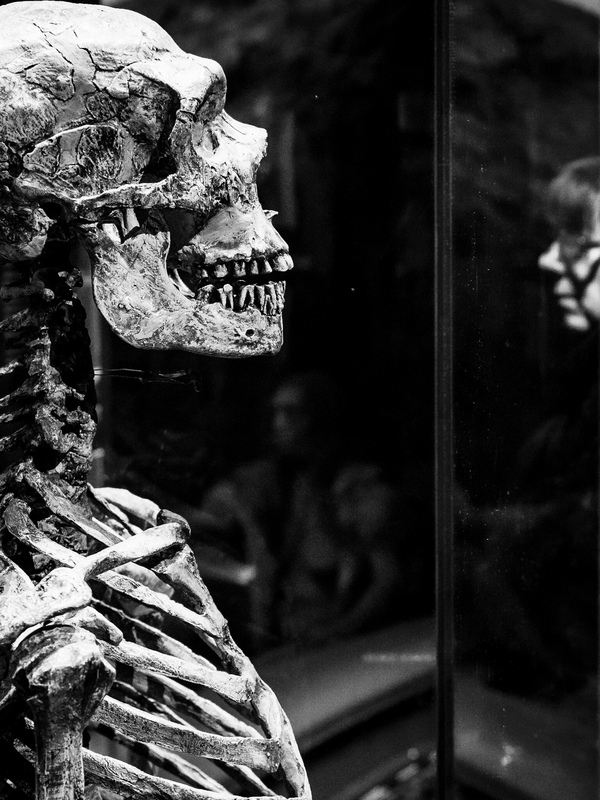 Also displayed are full-sized casts of important fossils, including the 3.2-million-year-old Lucy skeleton, the oldest know skeleton of a human ancestor. We finished our day at the museum in one of the most impressive exhibits, the Hall of the Dinosaurs. 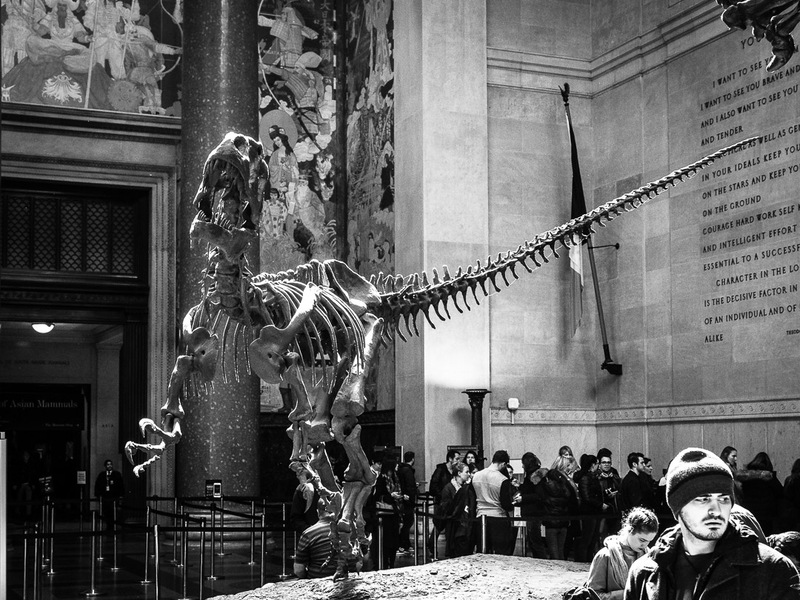 Here the highlights can’t be overlooked, with real fossils of a Tyrannosaurus Rex and a Apatosaurus (aka Brontosaurus) modeled in real life poses. The Significant Other also wanted to see the world’s largest gemstones, but this exhibit is currently closed for renovations. 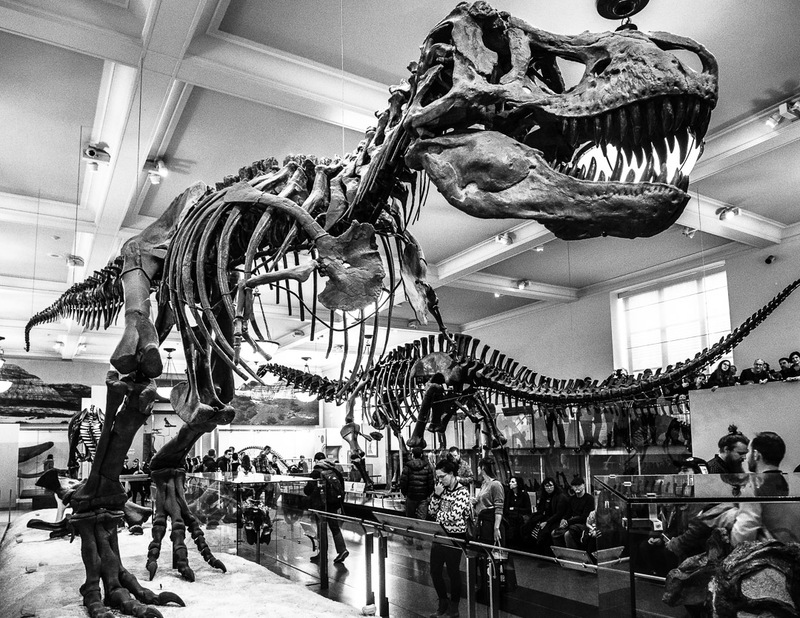 The AMNH is an awesome museum, and when you are in NYC you should seriously consider a visit, not only to escape any bad weather. All photos were taken with my Olympus OM-D E-M1 and the mZuiko 12-100mm F/4. The combination of lens internal image stabilization that can be combined with the 5-axis image stabilizer of the cam, I can should as slow as 1/5 sec handheld and get pin-sharp images, which makes this a prefect travel cam&lens combo. RAW conversion and post processing in Lightroom Classic CC. What a fab place to visit. Loved the skeleton pictures, and the reflection on the moon. Loved the photos! The skeletons are my favs! Thanks, Amy 🙂 ! A must visit when you make it to NYC! Great pictures in the museum, Marcus! I love my Oly 12-100 for the same reasons. My next lens will be the 12-40 Pro for indoors for it’s 2.8 aperture.